On October 11, when David Verghese made his final profession as a Redemptorist, he couldn’t help but recall a pivotal moment from a retreat he had once attended at Mount St. Alphonsus in Esopus, N.Y., long the location of the Redemptorists’ major seminary. 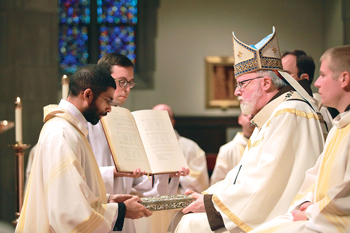 That life is now a reality for David Verghese, 33, ordained a deacon in Boston on October 12. Cardinal Seán O’Malley, the archbishop of Boston, presided, ordaining Deacon Verghese as well as eight Jesuit deacons. The Mass was held at St. Ignatius of Loyola Church in Chestnut Hill. Deacon Verghese had taken his final vows as a Redemptorist the previous day during a Mass at The Basilica of Our Lady of Perpetual Help (Mission Church) in Boston. Provincial Superior Father Kevin Moley received his promises of poverty, chastity, obedience, and perseverance. In the days before his ordination, he said, “I was nervous, but on the day itself I felt a wonderful sense of peace. It was the fulfillment of all that I’d dreamed of. Attending the ordination Mass were the new deacon’s parents; brother and family; three uncles; a number of cousins, including one who is studying for the priesthood for the Diocese of Lubbock, Texas; and some family members on his mother’s side who had traveled from India. Deacon Verghese is scheduled for ordination as a priest on May 31 in Annapolis, Md. A native of Leonardtown, Md., he grew up in St. Aloysius Gonzaga Parish and graduated from St. Mary’s Ryken High School in 1998. He spent a year working with the Missionaries of Charity in Washington, D.C., before entering the Redemptorist formation program in Whitestone, N.Y., in 2004. The Redemptorists weren’t the only congregation he considered. He also thought about the Franciscans of the Immaculate and the Missionaries of Charity Fathers. In 2007 he took a detour, becoming a seminarian for the Archdiocese of Washington. But two years later he rejoined the Redemptorist formation program in Boston. He completed his theological studies at Boston College in May 2012 and this past summer finished a pastoral year at St. Gerard Church in Lima, Ohio. There he visited the sick in local hospitals, taught in the parish school, and ministered to prisoners in two correctional facilities. Working with children in the parish school posed challenges of its own. “It was a little difficult because I was one of two guys who were walking around in religious garb, and the kids wanted to know what it was all about,” Deacon Verghese said. Deacon Verghese is now in residence at St. Mary Church in Annapolis. As a deacon, he will be able to perform baptisms, witness marriage vows, proclaim the Gospel and preach at Mass, and officiate at wakes and funerals. Deacons are servants of the people of God, as Cardinal O’Malley said during his homily October 12. That’s a point he kept returning to, said Deacon Verghese. Over the next several months the new deacon will have plenty of opportunities to mingle with the flock and serve them. And perhaps get a head start on that sniff test as he prepares for his priestly ordination May 31. View a slideshow from the ordination below.